I wanted to publish this last year, but by the time I had finished writing my post, spring was already in full swing and most of these events had passed. This year I'm getting an early start! Isn't it about time to start thinking of sunnier times? Chelsea Physic Garden is one of the places where you can catch your first glimpse of spring – over 75 species of snowdrop can be seen here! Normally closed to the public during the winter season, the historical botanical garden opens on a couple of weekends in February every year. This year, Snowdrop Days at Chelsea Physic Garden will take place on the weekends of 5 & 6 and 12 & 13 February, from 10am until 4pm. Just a couple of weeks later, the garden at Fenton House in Hampstead will reopen after the winter, this year on 5 March (Wednesdays to Sundays, 11am until 5pm). 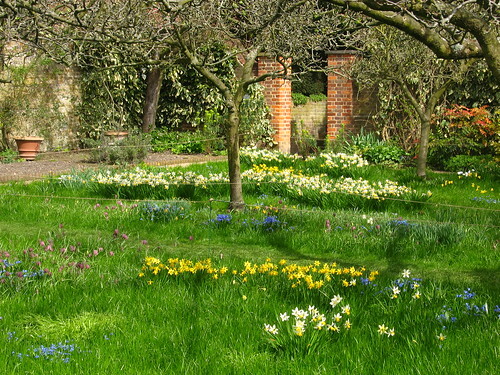 This is a traditional English garden with a 300-year-old apple orchard; in April, the lawn below the trees is transformed into a pretty spring meadow with daffodils and narcissi. Camellias, in bloom during March and April, can be seen at Chiswick House Gardens. The gardens feature a camellia shrubbery and a 19th century conservatory which is famous for its large collection of camellias, thought to be the oldest one in England. The gardens at Chiswick House are open all year around, with the conservatory reopening on 19 February for the 1st Camellia Festival, which will run until 20 March; the conservatory will be open every day from 10am until 3pm. From 21 March to 31 October it will then be open from 10am until 4pm. In May, bluebells add their lovely blue hues to most parks and gardens in London. If you fancy a walk through ancient bluebell woodlands, visit Oxleas Woods, near Eltham in South-East London. 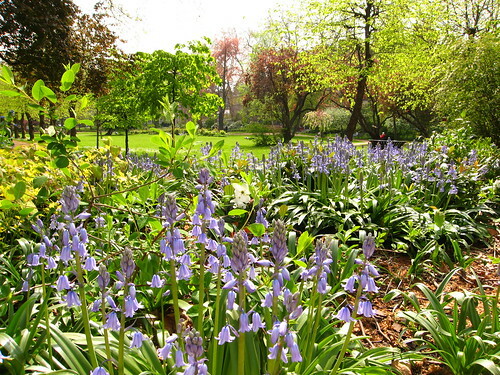 Gordon Square in Bloomsbury features a much smaller, but just as pretty display of bluebells. At the northern entrance of the garden, there is a sign explaining the different types of bluebells that can be found here. And there is, of course, Kew Gardens, where you can find any spring flower you are looking for. In March, there is a stunning carpet of more than 2 million purple and white crocuses to be seen. 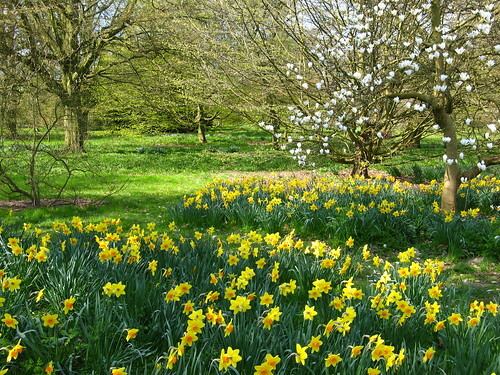 Later on, there are daffodils, glory of the snow and bluebells – check what's flowering on the Bulb Watch section on Kew Gardens' website!